Color Description: Reddish pink bracts with dark red tips and a red center. Availability: South Africa from May to June. General Comments: Striking red colours against dark to mid-green foliage. Opens up VERY nicely. See pictures. Tends to be offered at lower price points and offers exceptional value. A family of interesting and unusual long lasting flowers available in a vast array of shapes, colours and sizes. 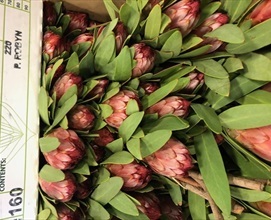 Widely grown in Californian as well as Australia / South Africa / New Zealand Protea are available virtually year round because of their opposite seasons. Most varieties of Protea dry very well. One of the oldest groups of flowering plants, protea have existed for over 300 million years. Protea are named after the Greek god Proteus , who could change his form at will. Protea are graded by stem length and bloom size. 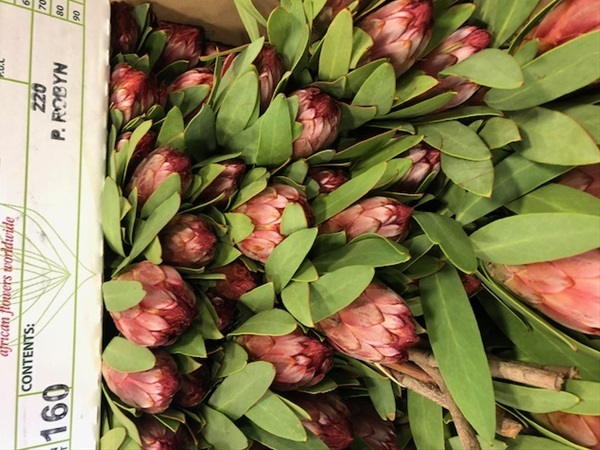 Florist quality Protea should be a minimum of 40 to 50 cm with some varieties reaching 100+ cm tall. Protea should be shipped with clean blooms. Because this is an outdoor crop, there may be blemishes on foliage due to weather conditions. The foliage can be easily stripped, and marking on foliage does not indicate performance issues in the bloom. Studies have shown that post harvest treatment with sucrose solution can help to avoid blackening of foliage. Leaves should always be removed from bottom 20 cm of stems.